Can we make learning delivery fun and engaging too? Corporate learning is usually among less popular things on an employee’s task list of the day. JollyDeck successfully tackles this challenge and makes learning both fun and engaging. Many would be keen to assume that having the solution setup, all you now need is to provide the learning content and … we’ve ourselves got a great learning delivery, correct? In real life this is usually far more challenging than it sounds. We’ve embarked on a journey with our clients to understand what it means to deliver a great learning experience. In the last year we built and launched close to a hundred bespoke learning campaigns with them, and found it a time consuming process which took a lot of effort. Much of this effort is hidden from the sight of business leaders, but can be tremendously rewarding when you see the responses of the learners. For this reason we decided to put our heads together to try figuring out if we could make the creation of e-learning campaigns fun and engaging as well. How should we do it? Should we pack the campaign building process full with incentives, rewards, badges, easter eggs… to create another game? In the end – it worked perfectly in our learning environment. As gamification evangelists we were certainly tempted to proceed this way. At the same time we know that creation of learning content is a demanding task which requires lots of thinking and strong concentration. Once in progress, it should not be interrupted by unnecessary gags. After all we’ve learned more than a handful of useful lessions from the implementation of Clippy – the famous Microsoft paper clip office assistant1. With all this in mind we started developing our brand new learning campaign authoring tool. We call it The JollyDeck Dashboard. First off we focused on the campaign creation process. We stripped all unnecessary operations and streamlined the procedure into a few simple self-explanatory steps. You start with a simple task and proceed to more demanding ones. You learn to build your first campaign by simply doing it. It’s a trial and error procedure, with no opportunity for a failure. No manuals, no wiki pages, no faqs. Just pure fun when you realize how easy it is and how quickly you can progress. One of our clients who was involved in testing of beta said that building a learning campaign reminds her of playing SimCity2. You enjoy building it and have fun watching the impact your effort has on learning in your organisation. We couldn’t agree more. The only difference is that unlike in SimCity gratification comes from impact you have in real life. Is there anything more rewarding than two thumbs up by your peers who really enjoyed what you have created? 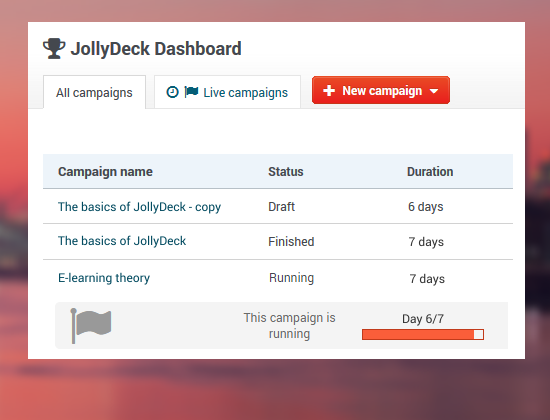 Next post: Announcing: JollyDeck’s new self-service Dashboard!